Crystal Mountain opened its $8 million Mt. Rainier Gondola in January 2010, and it’s rapidly become one of Washington’s “must do” attractions – for young, old and everyone in between. 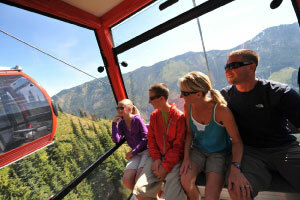 Ride to the top of Crystal Mountain in an 8 passenger cherry red gondola. Enjoy a scenic 10 minute trip to the summit where jaw dropping views of Mt. Rainier and the surrounding Cascade Mountains await your arrival. For Summer 2018, Crystal Mountain will be open daily from June 22 – September 16. On your way up the mountainside, watch for elk grazing below and see the rainbow of colors from the alpine wildflowers. Emerge from your comfortable Gondola cabin at 6,872 feet elevation with nothing but sky and gorgeous views in front of you. Take a walk at the summit area, or just sit and relax at the Summit House patio area and take in the views. Locals even offer interpretive hikes during summer months. Hungry? Enjoy a meal at the Summit House, the highest restaurant in Washington State — or enjoy a refreshing lemonade or tasty brew with your views. During the summer months, leashed dogs are welcome on the gondola and on the hiking trails. Please click here for the Mt. Rainier Gondola’s hours and rates for this summer. Groups of 15+, please call Crystal Mountain Resort at (360) 663-3015 for more information. Click here for group rates and information. Please Note: The gondola can accommodate wheelchairs. The accessible viewing platform at the top of the gondola is wonderful for viewing Mt. Rainier. The top path from the viewing platform is graveled and sloped. Wheelchairs can be pushed up the trail, but keep in mind it is a downhill slope back to the viewing platform.